Donald Trump has refined his proposal over the past couple months. His final position is that the United States should temporarily bar Muslim immigrants from certain countries where we know terrorists are training or operating, as well as from countries where U.S. authorities cannot adequately vet potential immigrants. Rather than a permanent ban, such a prohibition would be in place only until federal authorities can define the scope of the threat of radical Islamic terrorists infiltrating this country, and fully investigate all prospective immigrants. Clinton, liberal Democrats shout that such a policy is unconstitutional. 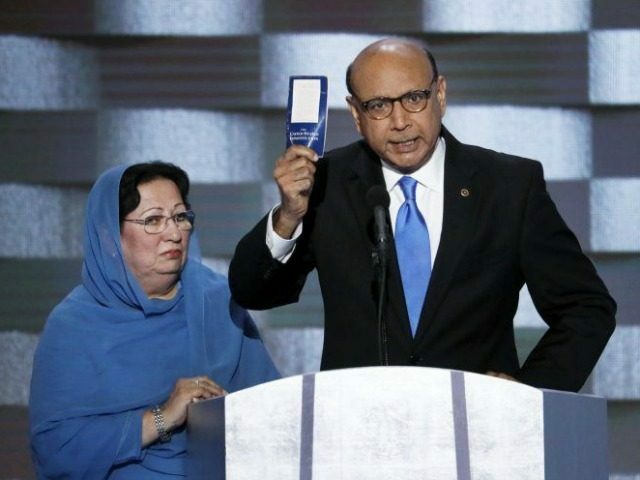 They are now joined by Khan, a foreign lawyer the Left laughingly advertises as a constitutional expert, despite the fact that Khan is an ordinary lawyer who does not litigate constitutional law cases, does not teach constitutional law, and has never published a scholarly work on the Constitution. With “experts” like Khan, it’s no surprise that they’re wrong. Three provisions of the U.S. Constitution are relevant to Trump’s proposed policy. Properly understood, all three allow Congress to work with a President Trump to fashion a law codifying this new policy. The first provision is Article I, Section 8, Clause 4, which empowers Congress, “To establish a uniform Rule of Naturalization.” Combined with Congress’s shared power with the president to govern the foreign policy of the nation, this provision gives the two elected branches discretion on who enters this country, how long they can stay, under what conditions, and by what process some of them can become citizens. This statute likely conveys all the authority needed for a president to enact the policy advocates, although liberal judges—and possibly some moderate judges—might disagree. But even if the statute does not delegate such power to the president, there is no question that Congress could amend federal law at any time to codify Trump’s new policy. This is the constitutional provision that the Left often cites as forbidding Trump’s ban. That argument is unquestionably wrong. The Religious Test Clause forbids government agents from taking into account a person’s religion only when considering whether to appoint that person to serve in the federal government. Government actors remain free to consider religion for any other purpose, and voters can consider religion for anything at all, even for public office. Ironically, the only government officials who have violated the Religious Test Clause in modern times are Democrats, usually over judicial nominations. Democratic senators opposed Judge Charles Pickering (a federal trial judge) when he was nominated for a seat on the U.S. Court of Appeals for the Fifth Circuit because of his evangelical Christian faith. But where immigration is concerned, as Andy McCarthy has explained, current federal immigration law already explicitly takes into account the religion of applicants. Many foreigners request political asylum in the United States because they claim to belong to a persecuted religious minority. Obviously the federal government cannot ascertain the truthfulness of their persecution claim without asking the applicant’s religion. Accordingly, 8 U.S.C. § 1158 provides that immigration authorities “must establish that … religion … was or will be at least one central reason for persecuting the applicant.” Thus, federal law actually requires immigration authorities to examine the religion of some foreigners. So despite the Left’s outcries, the Religious Test Clause is irrelevant to restricting Muslim immigration. In 1954 the Supreme Court held in Bolling v. Sharpe that although due process and equal protection are separately addressed as separate rights in the Fourteenth Amendment, and despite the fact that there is no clause requiring equal protection from the federal government in the Fifth Amendment, nonetheless the Fifth Amendment’s Due Process Clause includes an implicit guarantee of equal protection. The central meaning of the Equal Protection Clause was to eliminate government actions discriminating on the basis of race or national origin. Laws that make such distinctions are therefore subject to “strict scrutiny,” under which the law is presumed invalid, and the burden is on the government to prove that the law is narrowly tailored to achieve some compelling public interest. While the Fourteenth Amendment’s Equal Protection Clause applies only to a person “within [the] jurisdiction” of a particular state, the Fifth Amendment has no such geographical limit, so the Fifth Amendment’s equal-protection component extends everyone federal power is found. Conservative judges could hold that the ban is constitutional for at least three reasons. First, they could hold that the Fifth Amendment does not constrain the political branches’ policy judgments on immigration at all. Congress and the president acting together have completely unfettered discretion on who can enter the United States. If so, then politicians could ban anyone, even on the basis of race, religion, or national origin. Second, they could say that the Fifth Amendment is irrelevant, but when a court reviews an equal-protection claim here, strict scrutiny does not apply because the ban is not based solely on race, nationality, or religion. Instead, it is a ban on potential immigrants who fit a multi-factor profile, which applies only to specific parts of multiple nations. Religion is only one factor among several. If so, then the policy would be subject to rational-basis review, meaning it would be upheld unless the plaintiffs could prove that the policy was not rationally related to a single public interest. That judicial inquiry would precipitate a slam-dunk victory for Trump. Third, a court could hold that strict scrutiny applies, but that the ban satisfies strict scrutiny. National security is a compelling government interest—in fact, it is the Constitution’s top priority of the federal government. Judges could hold that a policy that is strictly time-limited, lasting only until the federal government defines the scope of the threat posed by radical Islamic terrorists, and strictly limited in scope, applying only to countries and parts of countries where overwhelming evidence proves that Islamic terrorists are operating, training, and trying to infiltrate the United States. The challenge is that liberal jurists might look at this quite differently, especially at the Supreme Court. Zadyvas thus holds that the Constitution does impose limits on immigration policy. While conservative justices could overrule that holding, liberal justices could cite it as a justification for an equal-protection challenge. The Court could have that strict scrutiny applies and that Trump’s policy fails that demanding test. If a president acted without Congress, these justices would acknowledge that 8 U.S.C. § 1182(f) permits a president to impose such a ban, but they would then go on to hold that Section 1182(f) violated the Fifth Amendment if applied in this fashion. On yet another issue, then, the Supreme Court majority created as a result of whoever the next president appoints to fill Justice Antonin Scalia’s seat will determine the constitutional fate of Trump’s policy. Clinton would appoint a liberal to that seat, essentially guaranteeing that any immigration restrictions would be struck down, which seems beside the point because Clinton would never make such a policy, and would veto any bill from Congress attempting to create such a policy. It also makes it all the more imperative for Trump to stand by his commitment to nominate a solid originalist to the Supreme Court, such as many of the judges on his current list of 11, or someone like former Solicitor General Paul Clement (who is the favorite of many conservatives). If Trump goes with a moderate or unproven pick, that person could side with the liberal justices to strike down key parts of Trump’s entire immigration policy. Examining its text, structure, and history, the original public meaning of the Constitution allows Trump to create his policy, especially if he does it through legislation passed by Congress. Any lawyer like Khan who argues to the contrary merely proves himself to be incompetent. But whether the policy would stand depends on whether a majority on the Supreme Court will be faithful to the original meaning of the Constitution.